The DYNAMIXEL AX-12A is a new version of the AX-12+ with the same performance, but with a more advanced external design. It is 100% compatible with the AX-12+ on a 1:1 scale, with the same control method. The gear design was changed to improve durability. Therefore, the AX-12A Gear Set (SKU No. 902-0087-001) will not be compatible with the former AX-12+ Gear Set (SKU No. 903-0087-000). **Click here to go to e-Manual. 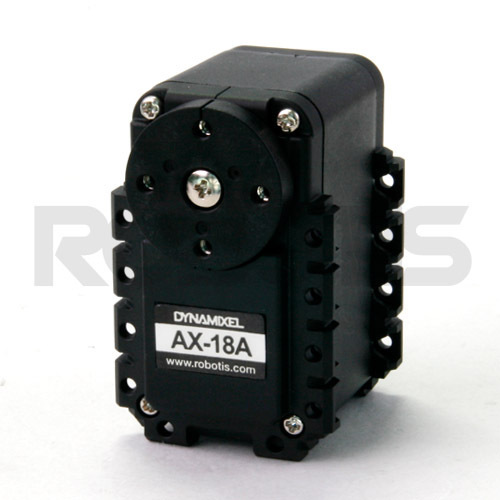 The AX-12W servo actuator from Robotis is a wheeled variant of the popular AX-12A. Essentially this servo is an AX-12A with a lower gear ratio so that a much higher RPM can be achieved, making it ideal for use in 'Wheel Mode' as opposed to the traditional 'Joint Mode'. 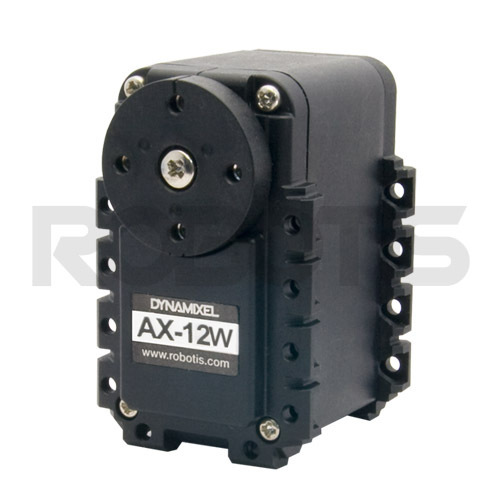 The AX-12W robot servo has the ability to track its speed, temperature, voltage, and load. As if this weren't enough, the control algorithm used to maintain shaft position on the ax-12 actuator can be adjusted individually for each servo, allowing you to control the speed and strength of the motor's response. All of the sensor management and position control is handled by the servo's built-in microcontroller. This distributed approach leaves your main controller free to perform other functions. The AX-18A is a newer version of the AX-18F with the same performance, but a more advanced external design. It is 100% compatible with the former AX-18F at 1:1 scale and with the same control method. A module actuator which incorporates all the function needed for joint of robot. Dynamixels that have unique ID are controlled by Packet communication on a bus. There are compliance margin and slope control functions. Its efficiency is high because it runs by high voltage and it improves stability of robot system that is formed by Dynamixel because current consumption is low.